In 2001, the Mariners and Huskies reached pinnacles. After that they fell hard, fast and a good long way. This weekend, both could reach national relevance again. Remarkable what is wrought by coincidence and calendar. For 15 years, the Mariners and University of Washington football largely have been irrelevant nationally. On the same Seattle weekend, all could change. The Mariners began the final four games of the regular season Thursday evening at Safeco Field two games back of the second wild-card spot in the American League playoffs. They have not been in the postseason since 2001 — the season as inexplicable as the Easter Island moai statues — when they were an AL-record 116-46. On Jan. 1, 2001, the Huskies, who Friday night play No. 7 Stanford at Husky Stadium, finished Rick Neuheisel’s second UW coaching year in the Rose Bowl, where they thumped Drew Brees-led Purdue 34-24 to conclude the 2000 season 11-1 and third in the national polls. Since then, for both outfits . . . dismay, despair, desolation and decrepitude. Unless, of course, you measure your sports majesty in bobbleheads and Heart of Dallas bowls. They entered Thursday night’s game against the anemic Athletics having won 14 of the past 20 games to climb over Kansas City, then New York and now Houston in the wild card race. They played 57 one-run games this season, most in the majors and emblematic of a season equal parts exhilarating and agonizing. To advance, they probably need to sweep the A’s, and even then, may end up tying for the second wild card. That would force a one-game playoff to get into the scheduled one-game wild-card playoff. Potentially, that could mean do-or-die games Sunday, Monday and Tuesday — then, a series. Pick out a comfy chair and hang on real tight. The season-long whipsawing constitutes a massively heavy lift that, to get this far, has already required burning through a club-record 29 pitchers. Yet over the past 15 seasons, every team in baseball has managed something similar to get to the playoffs, except for Seattle. In the bigger picture, it’s asking a lot of a Seattle-newbie general manager and first-year manager to pull playoffs out of a 76-win team with a mostly barren farm system, bolstered only by the hires of numerous lower-profile vets on one-year contracts to patch together contention. In the smaller picture . . . so what? It’s been 15 years, fercripesakes, for a team that, beyond all rational thinking, has been well-supported at the gate. No excuses. The chance for seismic change is upon them. As with the Mariners, the Huskies until now had not recovered from the plunge off the 2001 pinnacle. The Neuheisel firing over a gambling scandal led to a wrongful-termination lawsuit that Washington and the NCAA lost, embarrassing themselves nationally. The coaching turnover led to the disastrous Tyrone Willingham tenure, which included an unimaginable 0-12 season in 2008, making UW the only big-time school in NCAA annals with an unbeaten season and a winless season. The same year a book was published, Victory and Ruins, which detailed the crime and misdeeds that scandalized Nuheisel’s Rose Bowl team. To fix this smoldering heap, Chris Petersen in 2013 was hired away from a hugely successful tenure at Boise State. Now in his third season, he has assembled a remarkably talented, underclassman-dominated outfit that is ranked 10th nationally and much lower in the scandal-per-athlete ratio than many previous Huskies teams. In Stanford, the Huskies play their No. 2 Pac-12 Conference nemesis. The Huskies have lost nine of the past 11 meetings by an average score of 29.6 to 16.1, which includes wins in 2007 under Willingham and 2012 under coach Steve Sarkisian. By another calendar coincidence a week later, UW faces in Eugene its No. 1 nemesis. The Oregon Ducks have beaten Washington 12 times in a row by an average score of 42.3 to 17.7. 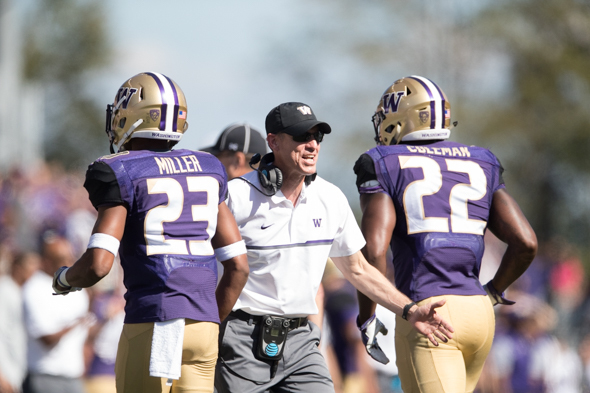 Erasing 15 years of often-sordid history is not possible for Petersen and these Huskies. But changing the outlook and relevance for the program in one nationally televised, prime-time night, followed by a second epic, is within their grasp. “This,” Petersen said, “could be college football at its finest. That would be a splendid theme for a rare Seattle sports weekend spiked by 110,000 attendees — 15 years and, finally, all in. The sports earth may move this weekend. For a change, it won’t be a Beastquake. The dawgs don’t need help from any other team–it’s on them to get it done or not; the Ms need help even if they win out. Tonight my attention is on Montlake–then I’ll scope out Safeco Field. Too bad #Mariners weren’t in WC spot entering weekend. Speaking of moving the sports earth, Go Link Light Rail! This is seriously weird. The last time I allowed myself to get this pumped for a Husky game the Dawgs got curbstomped by the Ducks in the last game in old Husky Stadium (what was I thinking?). This time around, I’m optimistic it will be different. The M’s however, my skepticism runs deep, and the scarring is thick. Not sure I’m willing to let them back into my heart.